Originaly 3ds max 2014 scene with growing snowflake made with Mesher modifier from particles in PFlow with Birth Group from fractured snowflake petal consisted from core and shell parts. 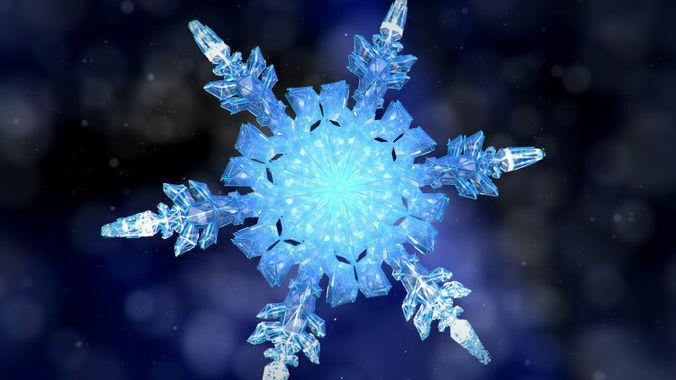 Snowflake divided on six petals(each pelal is core and shell) generated with Mesher modifiers from particles as described above. Each petal's Mesher modifier has different time offset. Petal itself generated with PFlow using Script Operator with simple code which takes positions of the plane models for the shell and the core particle groups and depending of distance from the plane to the particle changes particle's size. Shell and core have its own material. Model needs no textures and redered with two different materials(fresnel mask ant self-illumination add some nice look), but you can add textures if you wish. Before adding textures create UVs. *.Obj sequence included and has size 4.5Gb. You can use it in After Effects with Element3D plugin or in cinema4D for example. Video preview made in After Effects with Element3D plugin. Ae cc2015 project file included, just reimport obj sequence.